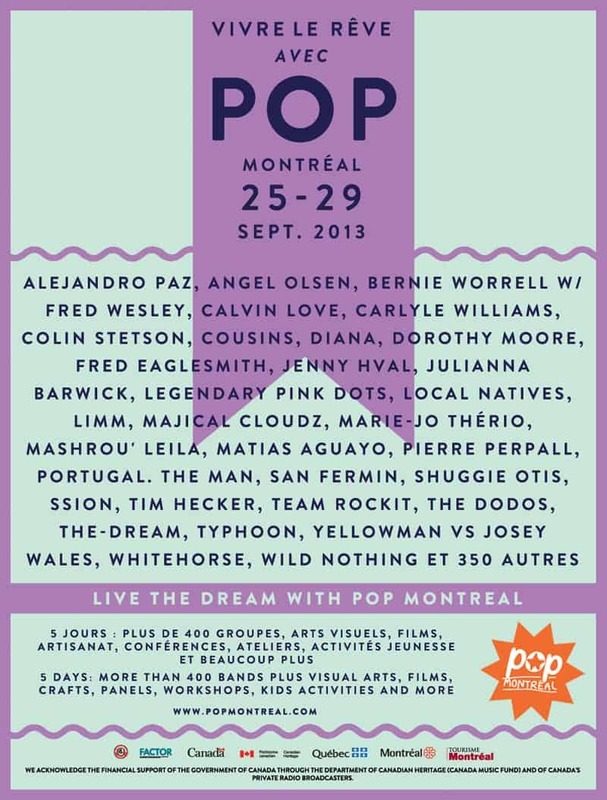 The POP Montreal International Music Festival launches the biggest and best version of itself this year, from September 25 to 29. The highlights of this year’s festival are numerous in nature. There’s the 9th annual free Art POP, a showcase of collaborative and multimedia artwork by both local and national artists, held at the Quartier Pop (3450 St-Urbain). Art POP’s opening vernissage party will take place Wednesday, September 25 at 6pm. Film POP is another component of POP Montreal this year, which will include a series of screenings, events, and workshops. A $45 pass will grant you access to pretty well all Film POP activities. The bi-annual Puces POP Art Fair will take over Mile End for the weekend, with some of our favourite local artists, clothing designers, jewellers, and wood-workers (plus waaaay more) on location at the Église St-Michel (105 St-Viateur). They’ll be there with all their latest wares from Thursday, September 26 to Sunday, September 29. Check out the website for hours and a list of participants. Full disclosure: I can see this particular church from my front balcony, and I will be there all weekend, buying all the things. And, of course, POP Montreal will predominantly feature a bombardment of fantastic, new and old, local and international music performances at venues across the city. The list of acts and shows is lengthy and completely outstanding. Check out the line-up here; bands with the subtitle “Festival 2013” will be performing at this year’s festival. for $345, which will grant you access to over 100 shows featuring over 600 artists. You know you wanna. Enjoy, Montreal! » Montreal Hit List – Divers/Cité, Osheaga, MEG Boat Cruise and more!